Op Art Overload: wearing Peter Pilotto pants in the AVAF installation that the Suzanne Geiss Gallery brought to the Armory Show earlier this year. I grew up surrounded by Op Art and Kinetics. Two of the most important Op Art representatives, Jesus Rafael Soto and Carlos Cruz Diez, which are both Venezuelan and both of which I had the pleasure to meet, inundated the streets of Caracas with public Op Art. Giant sculptures, monuments, murals and even the floors of major airports were covered with wonderful kaleidoscopes of geometric figures that tricked the eye, sometimes in a subtle way and in some others in a very disconcerting manner. That is what Op Art is: tricking the eye through an optical illusion. A movement that started in the 1960s with black and white shapes and became increasingly popular and also colorful when artists like Victor Vasarely, Josef Albers, Bridget Riley, Julio LeParc and of course, Soto and Cruz Diez, explored the depths of movement, light, curves, mathematical geometry and color interaction. This is the "Oppenheimer Bar" at the Hotel Americano. An installation and design created by Tobias Rehberger this past May. I was able to see the space before it opened to the public and I was blown away. 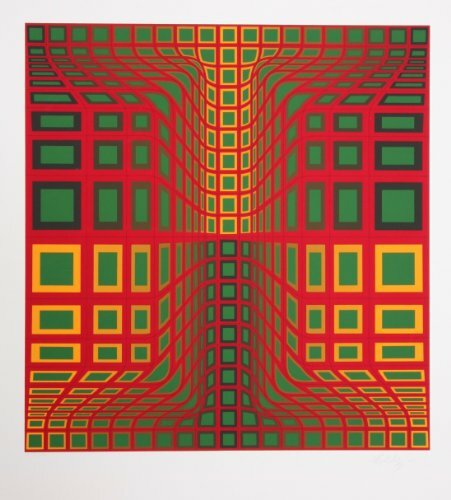 This year, in particular, I have seen a lot of Op Art in many, many different settings, including two extraordinary museum shows in Paris: a retrospective on Julio LeParc at the Palais de Tokyo and the mind-blowing and massive Dynamo at the Grand Palais which I documented here. 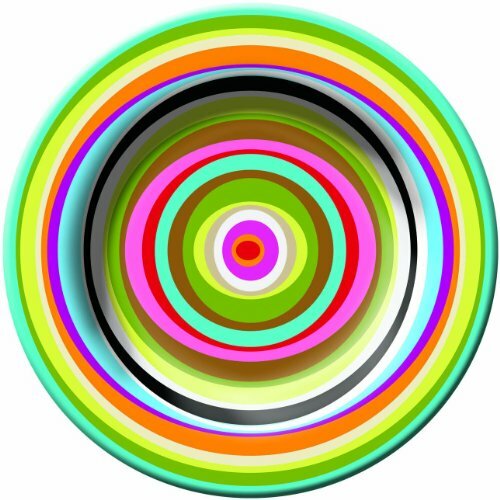 Contemporary artists like AVAF, Ugo Rondinone and Tobias Rehberger have at some point, explored Op Art and added their own elements to the mix with results that are quite extraordinary. In clothing and textiles, I think Peter Pilotto has done the best job in this arena with their impeccably silk-screened fabrics and Missoni, as a pioneer of knits, also takes a very important place in the revival of Op Art. In industrial design, in décor objects and in a myriad of other places, Op art is back. And here is a selection of fun pieces that can bring the optical effect to a room or to an outfit. 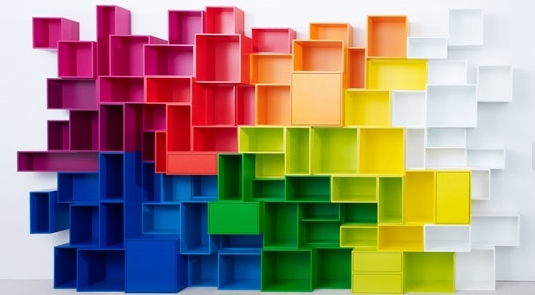 Cubit, a German company, manufactures these spectacular modules and I wouldn't even put books in them. The boxes come separate and once assembled together in whatever shape or manner, they become a piece of art. This is one of the best places to find the most beautiful rugs in the world. And they know how to do Op Art so well. I'm in love with this design called "Chiesa Yellow" - once on the floor it does become a whole different thing in terms of optical illusion. Melamine-chic, right on point, great designs and quite affordable prices. 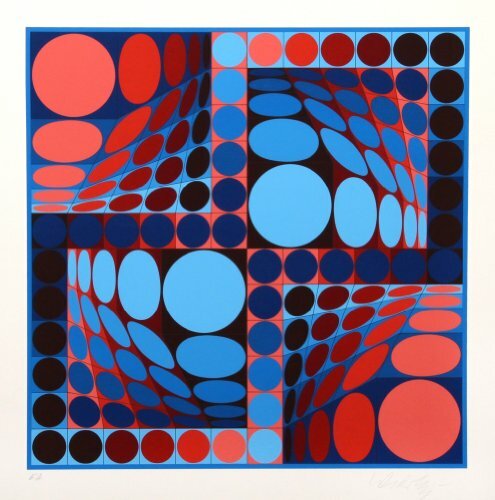 From one of the fathers of Op Art, you cannot go wrong with any of these limited-edition prints. I wore this gorgeous dress this past summer a lot. And I plan to wear it with jackets throughout the fall because I think it is a statement piece, so much fun and so unique. Although this same dress is no longer available, Peter Pilotto is so consistent that I consider their pieces to be investments for the long run. Since these designers don't deviate a lot from their matrix of spectacular printed textiles, one collection after the next, they are filling the runway with amazing designs that are becoming classics. The dress below is available at Net-A-Porter and ready to be bought by a daring fashionista.